Description: Machine Head Phil Demmel Concert Tour Guitar Pick. Reverse band logo. Description: Maroon 5 Adam Levine Concert Tour Guitar Pick. 222 M Logo Black. Description: Maroon 5 Adam Levine Concert Tour Guitar Pick. 222 M Logo White. Description: Maroon 5 Adam Levine Concert Tour Signature Guitar Pick. Description: Marty Stuart Tour Guitar Pick. Reverse side Fender logo. 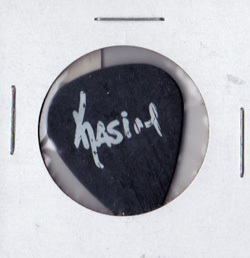 Description: Meat Loaf Kasin Concert Tour Guitar Pick. Reverse side band logo. Description: Metal Church Concert Tour Guitar Pick. Description: Misfits Concert Tour Guitar Pick band logo. Description: Moby Concert Tour Guitar Pick. Reverse side Moby cartoon logo. Description: Monster Magnet Concert Tour Guitar Pick. Description: Motorhead Phil 'Wizzo' Campbell Concert Tour Guitar Pick. Green. Description: Motorhead Phil 'Wizzo' Campbell Concert Tour Guitar Pick. Black. Description: Motorhead Road Crew Concert Tour Guitar Pick. Description: Musicians IM Is MI PromoTour Guitar Pick.